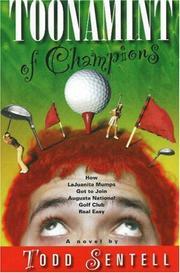 Though the stuffiness of the Masters tournament and the protocols of Augusta National are prime targets for satire, this scattershot novel fails to distinguish funny from dumb. Dan Jenkins has set a standard for sports hilarity that this slapdash fiction (subtitled “A Particularly Allegorical Comedy of Real Bad Manners”) never approaches. Instead, golf writer and marketer Sentell subjects the reader to an onslaught of weird names, outlandish situations and run-on sentences that never add up to much. His protagonist is Waymon Poodle, a bank-teller who specializes in customer service, though his appearance suggests inbreeding or alien life-forms. Waymon’s fiancée is hairdresser LaJuanita Mumps, who keeps attempting to convince Waymon that their pending nuptials give them permission to fornicate. They live and work in Mullet Luv, Ga. Whatever Waymon feels for LaJuanita can’t compare to his passion for golf and obsession with Augusta National. He had searched for an apartment until he discovered an available one with the number 1931, the year Augusta was founded. He drives a green beater and talks on a green telephone, both in homage to the green jacket awarded the Masters champion. He has painstakingly assembled a miniature model of the golf course in his apartment’s spare bedroom. Yet Waymon is somehow unaware of the conditions under which he might be permitted to play Augusta National, his life’s dream. The bulk of the short novel concerns Waymon’s quest to involve himself with the Masters and eventually play a round at the course. In the process, he thwarts a woman who has threatened to expose her “Bermuda grass” at the tournament, much to the consternation of Augusta chairman Leonard “Huge Pecker” Leboeuf. Waymon ultimately has a climactic encounter with Jack Nicklaus, who keeps referring to himself in the third person as the “Golden Bear.” Mayhem and alleged mirth ensue, as Waymon fulfills his fantasy and the non-golfing LaJuanita becomes the first female member of Augusta National. Compared to this, Caddyshack is Shakespeare.